Westpoint Ashbourne is a modern, dedicated livestock veterinary practice providing a comprehensive range of health-orientated services to farms in and around the Ashborne area. Outside office hours, the on-call vet will receive all emergency phone calls to provide 24hr emergency care. For medication pick ups and other visits to the office, outside office opening hours, please contact our veterinary staff. 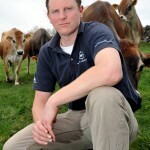 James was born into a farming family in Gloucestershire and grew up working with the dairy, beef and sheep enterprises run by various members of the family. 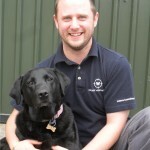 James graduated from the Royal Veterinary College in 2003 and went straight into livestock practice with Westpoint Veterinary Group, working from the main office in Sussex for five and a half years and developing close links and friendships with the farmers in the area. However, due to family reasons, the South East was not a long-term option, and it was decided to start Westpoint Ashbourne, and take the Westpoint practice ethos to the farmers of Derbyshire and beyond. James enjoys all aspects of farm animal veterinary work with a particular interest in the impacts of housing, management and nutrition on animal health and productivity. This feeds into a keen interest in dairy cow nutrition and lameness, and James has completed several external training courses in this area. On the cow-side, fertility work, surgery and foot trimming - in which he is Dutch-trained - are all interests, along with mastitis and general sick cow work. James is clinical lead of our Mobility working group. Out of work James enjoys playing and watching rugby, as well as cycling and walking - hence why the Peak District was the No 1 choice! Originally from York, Sarah grew up in a farming village and milked cows and lambed sheep from an early age. Graduating from Edinburgh in 2001, she immediately took a job in a mixed practice in Derbyshire. During the six years in Matlock she became the main farm vet, introducing health planning for cattle and sheep and starting regular farm meetings. In 2007 she was approached by a large practice in Derby to join their farm team, where she worked for 3 years until joining Westpoint in 2010. She enjoys all aspects of farm practice, especially surgery. Sarah also has a strong interest in sheep, goats, llamas and alpacas. She wants to encourage the use of health planning on beef and sheep units as she firmly believes that the prevention and eradication of disease is definitely the future for a profitable farm. 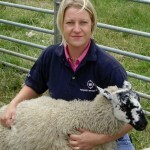 Sarah is married to a sheep farmer and lives in Derbyshire with her family. David undertook his veterinary studies at the University of Bristol. Since graduation, David has gained experience in predominantly dairy practices in Cumbria, Lancashire and Cheshire, working with herds from 100 up to 1000 cows. His main veterinary interests lie in mastitis management and he is a member of the Milk Quality working group within Westpoint. He also has very useful expertise in data analysis and benchmarking. 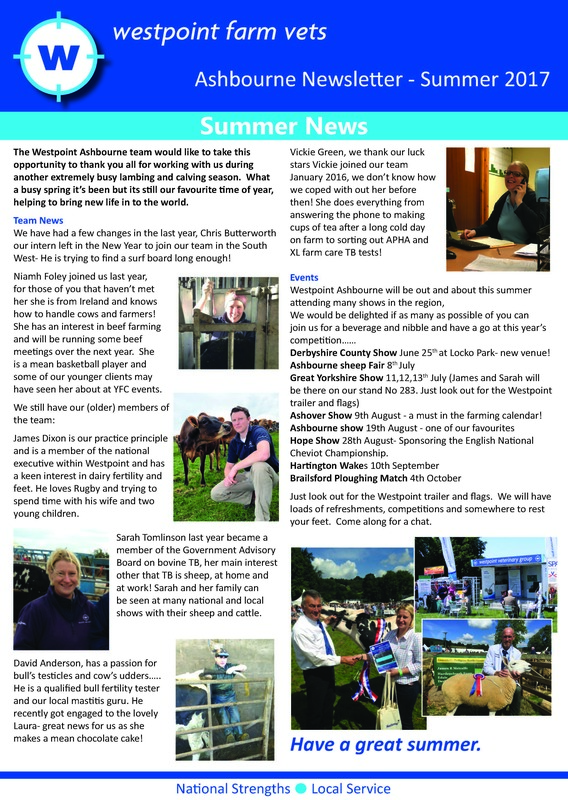 David joined the Ashbourne team in 2014 and is enjoying working closely with our sheep and beef farmers as he moves away from the Cheshire plain. He is also keen to get involved in bull and ram fertility testing. In his spare time David enjoys walking his dog in the Derbyshire countryside. Niamh (pronounced ‘Neev’) graduated from Szent Istvan University, Budapest in March 2015. She is originally from Monaghan, Ireland where her childhood was spent around horses and beef cattle. After graduating, she took up a farm animal position in County Tyrone, Northern Ireland. 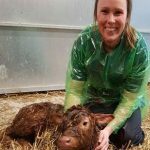 Niamh is interested in all aspects of farm practice in particular, surgery and internal medicine. She is also interested in herd/flock health, fertility and housing. She is keen to get involved with the National Johnes Management Plan in the future. In her spare time, Niamh likes to event horses, play basketball and participate in Young Farmer events. Jo went to Nottingham vet school, and is now based at our Ashbourne practice, but home is Chester. She likes all areas of farm veterinary but being outside and getting know the farmers and their farms are bonuses of the job. 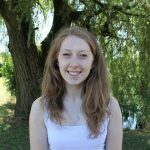 Outside of work, Jo enjoys indoor bouldering (and is hoping to get outside in the Peak District), swimming, gymnastics, baking and exploring the countryside; she's not one for sitting still!